“I don’t remember saying these words and I did not flash my middle finger,” Kottak said to prosecutors. A member of the heavy metal band Scorpions was yesterday sentenced to a month in jail for insulting Islam and lifting his middle finger at Muslims at an airport. 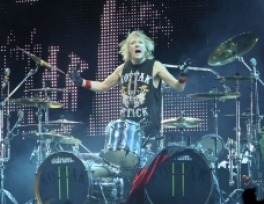 James Kottak, 51, the American drummer for the German band whose hits include Rock You Like a Hurricane, said he drank five glasses of wine on a flight from Moscow to Dubai. He was in transit to Bahrain to perform at the country’s Formula One grand prix about 11pm on April 3. He said he and a friend had taken a wrong turn and enter-ed the transit hall. 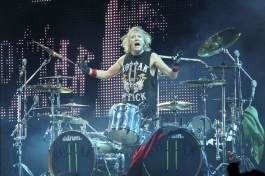 Kottak was arrested for being drunk and became angry, witnesses said. They said he started swearing and talking about “non-educated Muslims”, then flashed his middle finger at Pakistani passengers. Police said he also exposed his behind. Kottak, who pleaded not guilty to insulting Islam and raising his middle finger, was also fined Dh2,000 for drinking without a licence, to which he pleaded guilty. He has been held since April 3, and will be released soon because of the time served. Policeman A A said he heard Kottak say, “What is this disgusting smell?” before he insulted Islam. “I didn’t see anything else but I heard him. I then informed my supervisor, who came and took the defendant away,” A A said. He added that the drummer then started swearing repeatedly at the arrivals area of Terminal 2. Police said in records that when he lowered his trousers he was asking people to touch his behind. When asked about taking down his trousers, he said “this is not true – I just lifted my shirt up to show the tattoo on my back” as a “spontaneous act”. At Dubai Court of Misdemeanours yesterday, his lawyer said his client was innocent and the witnesses must have been misunderstood. “Their testimonies are contradictory, your honour,” said Hamid Al Khazraji.